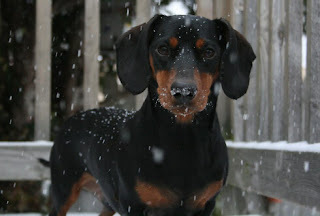 Meet handsome black and tan smooth 'Sampson' from Chicago, Illinois. Sampson lives with his littermate black and tan smooth brother 'Tommy,' and English Cream longhair sister 'Gina Marie.' He's the big brother that manages his crew. 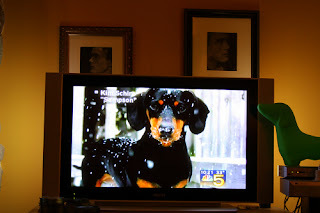 Sampson was on the local Chicago NBC news last night in their weather photos feature. Way to go Sammy! We know Sammy personally, he's best buddies with Joey. Now, Joey will play with Maggie and a few other doxies sometimes at local dachshund meetups, but he really likes to play with Sampson. It's so fun to see the big standard boys go at it, they're both usually pretty laid-back fellas. They'll get really wild, even get up on their hind legs and wrestle with their front paws, then after about an hour, they settle down and lick each other's ears. 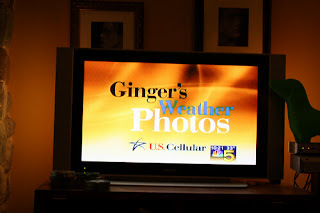 My big 3 seconds of fame!